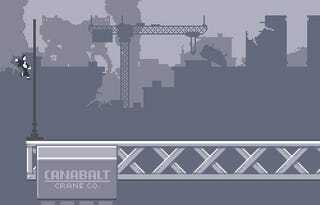 Stylish indie platformer Canabalt, which we loved as a Flash game and as an iPhone app, is now lovable in another form—a mini-soundtrack. If having access to the game via your iPhone or iPod Touch wasn't enough, you can now purchase Daniel Baranowsky's soundtrack to the excellent one-button platformer for constant listening. You can also make various Canabalt themes your ringtone, to out-annoy your fellow iPhone owning peers. You can name your price, as long as that price is $3 or more for the entire soundtrack (of somewhat questionable value, considering the $2.99 USD asking price for the full game). But, hey, if you really really love Canabalt more than three measly bucks, you know where to go.